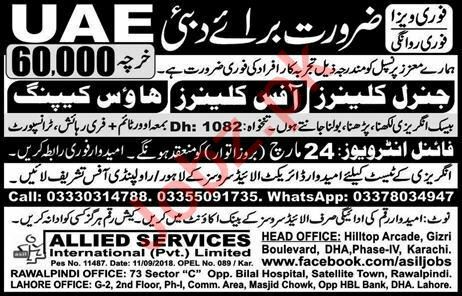 is looking for experienced and energetic candidates for the posts of General Cleaner, Office Cleaner, House Keeping in Dubai, UAE. Transport, Food & Residence will be given by company.Interested candidates can contact on given details for more information. You can apply online at vacancy after registering at http://www.jobz.pk site.